Identity has become the most essential aspect of modern business enablement. Cloud technology, mobility, web portals, and 3rd party integrations require dynamic and agile access management capabilities for secure information sharing and data protection. Unfortunately, many Identity Access Management products in the market focus only on establishing a trusted user and enforcing roles, but do not have the ability to also inspect the data that the users are sending and receiving. 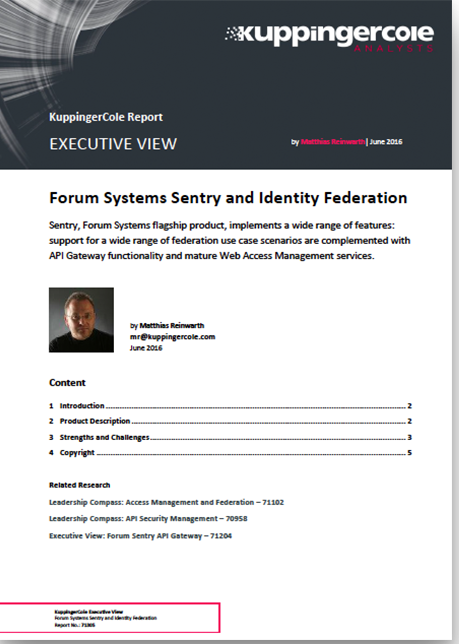 Fill out the form to the right and download a copy of KuppingerCole's Executive View on Forum Sentry and Identity Federation. Read why the leading European analyst firm has recommended Forum Sentry, stating the solution is an "innovative approach, combining data security with Identity processing"